Description: Official Printer Paper can be substituted with a 1.5-inch-wide (38 mm) thermal paper without repercussions on the printer. Box Text: Shoot-Print-Stick. 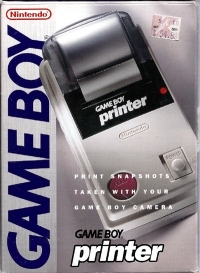 Link the Printer to your Game Boy system and print out your favorite Game Boy Camera snapshots! Special adhesive-backed printer paper turns any snapshot into a sticker! 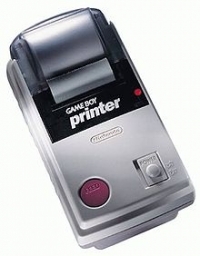 The Game Boy Printer is also compatible with all Game Boy games bearing the Game Boy Printer icon. The Game Boy Printer accessory comes with everything you need to print from any hand held Game Boy system. Includes universal Game Link cable, 6 AA batteries and one roll of printer paper. Additional paper sold separately. Game Boy Camera. 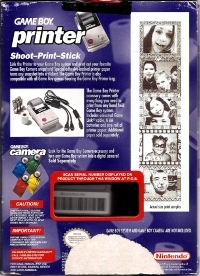 Look for the Game Boy Camera accessory and turn any Game Boy system into a digital camera! Sold Separately. This is a list of VGCollect users who have Game Boy Printer [NA] in their Collection. This is a list of VGCollect users who have Game Boy Printer [NA] in their Sell List. This is a list of VGCollect users who have Game Boy Printer [NA] in their Wish List.